The bellísimo beaches of southeastern Italy feature golden sand and azure waters — but even on a midsummer’s day, you won’t find many people. The reason: Just offshore, thousands of stinging jellyfish bob in the waves. Savvy locals warn visitors not to wade in too deep or put their heads under water. “If you were to run into one while swimming, your face would be red like a chili for three days,” says Stefano Piraino, a marine biologist at the University of Salento. It’s an increasingly common problem in the Mediterranean, according to Piraino, costing coastal communities millions of euros in lost tourism revenue, infrastructure damage and fisheries losses. And jellyfish aren’t only wreaking havoc in southern Europe. In Japan, fishermen often find their catch replaced by netfuls of the throbbing blobs. Sweden even had to shut down one of its main power plants when thousands of jellyfish clogged its cooling pipes in 2011. Marine researchers remain puzzled about what’s causing the apparent increase in jellyfish swarms — jellyfish have largely been understudied in the past and still, they remain poorly understood. 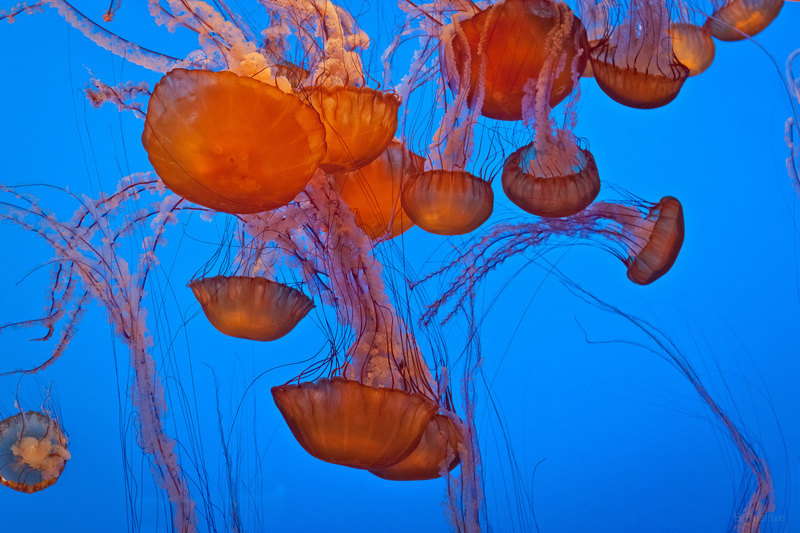 Some think that the jellyfish swarms are linked to natural oscillations in environmental conditions. Others suggest that a combination of human-induced problems — including warming temperatures, ocean acidification, pollution and overfishing — may be to blame. Additionally, jellyfish are highly adaptable and skilled at surviving in warm, polluted and acidified waters — conditions that kill many other fish. They may outcompete smaller fish, taking their place in the food web. Whatever the cause, these brainless clumps of jelly have proliferated, becoming more than just a nuisance; they are an economic curse. Now scientists are trying to make the best of a goopy situation and turn these creatures into a money-making commodity, so people will want to hunt and sell them, rather than just throw them back into the ocean. Recently, a collaboration of marine researchers from eight different countries began a project called GoJelly to create an array of jellyfish-based products, including water filters, fish feed, face cream, fertilizers and food. Currently, almost all of the jellyfish scooped up accidentally in fishing nets is wasted, says Jamileh Javidpour, who is coordinating the project from the GEOMAR Helmholtz Centre for Ocean Research Kiel, in Germany. The gelatinous creatures are typically either thrown back to sea or tossed in the trash. “What GoJelly wants to do is to buy those jellies that are in the fisherman’s nets anyway and re-use them,” she says. The project is only just starting (they had their first meeting in January) but it hopes to capitalize on jellyfish overpopulation while also addressing microplastics pollution. Tiny particles of plastic, often from cosmetic products, are too small to be removed by most sewage treatment facilities and instead end up in the ocean. GoJelly is developing a water filter made of jellyfish mucus that could capture those particles during sewage treatment. “Jellyfish have drool,” says Dror Angel, a marine biologist at the University of Haifa in Israel who is involved in the research. This “drool” — the sticky, snot-like substance jellyfish secrete when stressed — seems to stick to microplastics. In February, Angel’s team collected their first samples of jellyfish mucus. Preliminary tests were promising, according to Isam Sabbah, a chemical engineer at Braude College, also in Israel, who is working alongside Angel. Their work is novel, but it builds on prior research that shows jellyfish mucus can remove nanoparticles, which are even smaller than microplastics. In fact, all the GoJelly products are grounded in prior research, but only a few have made it past the lab. In Europe, jellyfish collagen — thought to be an anti-aging elixir — is used in some wrinkle-fighting creams. In Japan, researchers have experimented with adding jellyfish to agricultural fields as fertilizers, either by grinding them up into a sludge or plopping them down whole. And in China, scientists have attempted to feed farmed fish a mixture of jellyfish and standard feed. The results have been encouraging: Something in the jellyfish makes both fish and plants grow bigger, faster. “There’s all kinds of experiments being done,” says Lucas Brotz, a jellyfish researcher at the University of British Columbia, who is not involved with the project. A group at the University of Denmark, for example, recently devised a way to make a jellyfish snack chip by dunking the jellyfish in ethanol and then leaving them out to air-dry on a cookie sheet — a process that makes their gelatinous texture become crisp, according to an article in NPR. According to Mathias Clausen, a gastrophysicist who is leading the research, jellyfish are an under-used resource. But so far there still isn’t much of a market for these gelatinous creatures. Other than collagen and a few other compounds, researchers still don’t know much about their nutritional value for humans. Pound for pound, they are far less valuable than other fish. “Jellyfish are 95 to 98 percent water,” Brotz says. And water is heavy. Going out to sea to collect these organisms, which are essentially bags of water, he says, is an expensive process that doesn’t scale up efficiently. Investing in infrastructure to support a future fishery is also economically risky. “Jellyfish populations are inherently dynamic,” he says, so this year’s blooms could be next year’s busts. Another hurdle is cultural resistance. While East Asian nations eat jellyfish regularly, western cultures aren’t sold on the idea (some have described them like eating “salty rubber bands,” according to the NPR article). A team of GoJelly researchers in Italy is working to find ways to process them to suit Western tastes. The researchers are also seeking a better understanding of jellyfish’s nutritional value for humans. They have even started putting together a jellyfish cookbook, including a recipe for chocolate-covered jellyfish. “I didn’t think I would be able to stand the process of chewing and swallowing them,” Javidpour says. But when she tried the prepared jellyfish, she was pleasantly surprised. They are crunchy, not slimy, she says. And they take on the taste of their sauce. Still, there is a lot of work to be done before the GoJelly products will be ready for market, and it may take longer than the project’s planned two-year study period, according to Piraino. But perhaps the bigger problem with the project, according to Brotz, is that it doesn’t deal with the root cause of the jellyfish problem. Jellyfish reproduce via stalk-like polyps on the seafloor, so harvesting the ones at the water’s surface may not change the intensity or frequency of the dreaded jellyfish blooms, he says. Another concern, according to Brotz, is that adapting fisheries to abnormally high jellyfish populations might be side-stepping some of the major environmental issues that could be causing blooms in the first place. “It almost makes it OK to keep polluting or overfishing or whatever the ultimate cause might be,” he says. Javidour agrees: GoJelly won’t address the root causes of jellyfish booms — it’s a problem that scientists still don’t fully understand or know how to tackle. In the meantime, tapping into this abundant resource may be better than throwing it away. And harvesting some of them might reduce accumulations along the coast at least temporarily, Javidpour postulates. For now though, the GoJelly researchers are only harvesting a few jellyfish at a time to study their goop. On the Italian seaside, beachgoers may not see their jellyfish problems completely disappear anytime soon. But it’s possible that their woes may become easier to swallow — especially when they’re covered in chocolate.